Xe3d region has well separated spin-orbit components. Xe is a gas and is not commonly found in XPS spectra. Xe may be observed as implanted atoms, if a material has been subjected to Xe ion bombardment using Xe gas instead of the more usual Ar gas. This odorless and colorless gas has a high molecular weight, which is often useful when used in atomic energy fields in bubble chambers, probes, and other applications. Xenon was identified a few weeks after the discovery of krypton and neon – all zero-valence elements know as noble gases. Xenon is used to make strobe lights. 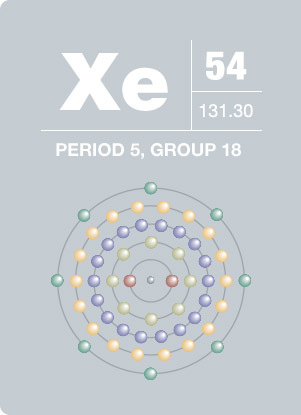 There are nine stable xenon isotopes, many of which have important medical applications. Three are used extensively in diagnostic procedures, while another is used in the treatment of prostate cancer.